Frederick Woolford of the Canadian Expeditionary Force came to the attention of Purton based military historian Bob Lloyd because his name is listed in the St Mary’s Church WWI memorial book. 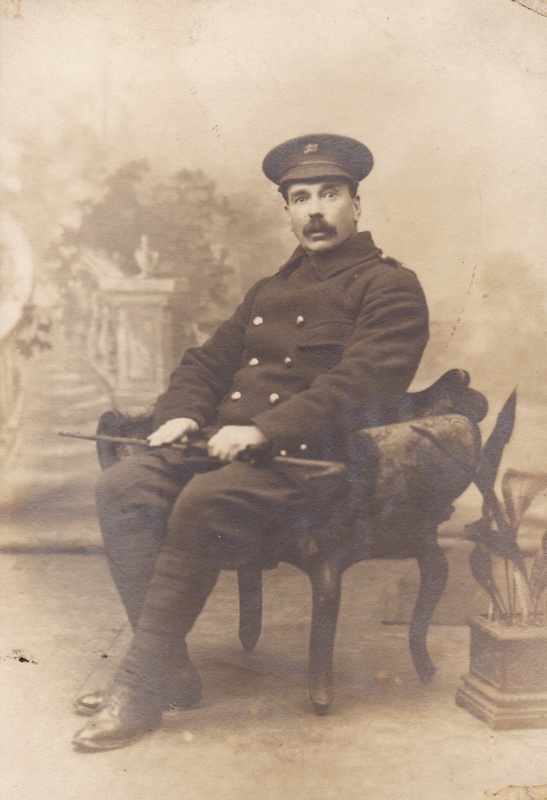 Though born in Purton, Fred was living in Canada at the outset of the First World War. He enlisted in the Canadian overseas Expeditionary Force on 19/09/1914 at Val Cartier, Canada. The age he gave on his enlistment papers was 39 years 5 months, stating that he was born in Purton, Wiltshire, UK on 17 March 1875. However, Fred was actually born on 17 March 1864 – making him the grand old age of 50 at enlistment. The Recruiting Officer cannot have been scrutinizing volunteers too closely, as Fred’s enlistment papers clearly show that the date of birth has been altered to 1875 – the 7 being heavily rewritten. Upon enlistment, Fred’s address was listed as 181 Division Street, Kingston, Ontario, Canada, and his next of kin was Emily Augusta Woolford (nee Wheeler) who he married in Purton in 1898, while living at 2 The Villas, Purton. During the conflict, Fred received a gunshot wound to the head. He was discharged as medically unfit in 1919 and his proposed residence was back at his old address in Purton. By this time he was 55 years old – although according to his military notes, his last recorded birthday in service was only his 44th. 36226 1st Canadian Mechanical Transport CASC. Divisional Ammunition Supply Column. 28/07/1915 Admitted to No2 Canadian Field Ambulance, then Hospital Bailleul. Wounded at Steinwench, being thrown from a loaded wagon, large contusion to scalp requiring 22 stitches. 30/07/1915 No8 Casualty Clearing Station before transfer to rest Station at Mont des Cats, Gunshot wound head (scalp), then transferred to Le Treport. 13/08/1915 East General Hospital Brighton. 02/09/1915 Taken on strength at Shorncliff, then transferred to Con Hospital Epsom 01/10/1915. 29/10/1915 Discharged, proceed to Depot. 09/03/1916 Considered fit for clerical work CASC. 16/07/1916 Canadian Army Service Corps transport Depot, Shorncliff. 11/07/1917 Boarded for return to Canada. 23/07/1917 Transferred to discharge Depot Buxton. 22/09/1918 Sailed for Canada. SOS to CEF, no suitable employment in England. 04/09/1919 Discharged being medically unfit, proposed residence 2The Villas, Purton. Papers showed his last birthday as aged 44; however he was actually now 55 years old. Evidence for inclusion on the Purton Parish list: 1918 voters list for Purton Parish (a NM), New Road. Name listed in the Memorial book in St Mary’s Church, Canadian National Archive details.